If you donât want to make your own you can buy some absolutely amazing vampire drinks at Vampire.com. They have vampire wine, vampire beer, vampire energy drinks and vampire vodka, vampire soda – everything a vampire party needs. Bring water to a boil and remove from heat. Dissolve the Jello in boiling water, stirring at least 2 minutes until gelatin is dissolved. Add cold water and Cinnamon Schnapps. Add a drop of red food coloring, if you like. Pour the mixture into shot glasses or paper cups. Let sit in refrigerator for at least 4 hours. Combine all ingredients in a large punch bowl. Add ice and stir. For adult version, add 4 cups berry vodka and 1/2 cup orange liqueur. Make as many cupcakes as you like, from scratch or from a box – your choice. Puree cherry pie filling – a syrupy mix of sugar and cherries, usually – in a food processor until fairly smooth. Very small pieces of cherries are ok.
Take a cooled cupcake and, using a small pairing knife, cut a cone of cake (1-inch across by 1-inch deep) out of the top. Trim off the pointy end of the cone, leaving a flat circle of cake. Set aside and repeat this process for all the cupcakes. Frost them with white frosting of your choice and using a toothpick dip it in some of the cheery puree and make two bite marks on the cupcakes. Dribble extra to make the bites look nice and bloody. Make your own fortunes. Print them up and cut up a bunch of fortunes. To make it vampire themed, make the fortunes quotes from your favorite vampire book or movie. Place each fortune cookie in the microwave for about 30 seconds or until it becomes soft. Carefully open up the cookie and remove the original fortune and then add your quote. Re-close and re-shape your cookie. As your cookie cools and dries it will harden. In a large bowl, combine the oil, mayonnaise and eggs. Stir in the cake mix and oatmeal. Roll the dough into 1 – 1 1/2″ balls. Drop onto ungreased cookie sheets. Bake for 8 – 10 minutes, don’t overcook. Cool on cookie sheet one minute. Transfer to wire racks to finish cooling. 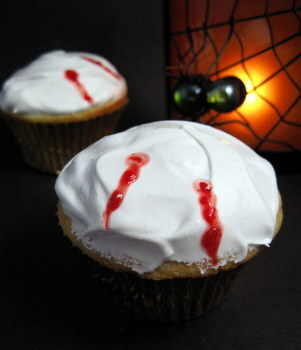 And there you have it, some tasty vampire party goodies. Enjoy and be safe.